I am Sonam, but however to my friends in blogging and social networking sites, i am best known as Sogyel. Currently, i am studying Architecture in School of Planning and Architecture, New Delhi. Hopefully by 2012 May, i would complete my Architecture Degree. It’s very difficult to many people to actually define one selves. We have studied so many things on others, and know so many things about others that we can go on describing many people around. There won’t be a single occasion where you would have found yourselves in a position not being able to gossip or pass comments on others. But when asked about yourself, you are in the confusion not exactly being able to tell what you are and how you are. It’s a very difficult question to ask “Who am I?” and many do not seems to have the answer. I have found myself couple of times in similar situation. Am I someone who I am not being able to live outside but just inside or I am someone as perfectly as I live outside with all fellow human beings? It was a difficult call. Are there so many things which I don’t know about myself? Or I know only few things which I like to do and despise to not to get? What kind of people I like to hang out with? What makes my day a happy day? Who all are the ones who I look up in life for inspiration? Therefore I decide to pen down few things that would make easier for me and others to actually understand me. Three things that I prize most in life? Parents and siblings. They are above anyone, of course I have friends as well. My grandpa, so sad that life took him away even before I could really thank him for everything he did to keep me alive. One person who inspires me so much in screen? Brad Pitt (be it Pitt in some bad boy bank robbing movie, or someone aging young, I always fancy to be like him and to be able to talk like him; with style and brain). Cristiano Ronaldo. The line that he followed to reach to the level he is now is simply incredible and inspiring. As a football fan, it makes me easy to relate myself to the reason why I like Cristiano. Two cities that I like to be in? Milan, no specific reason, but just the name makes me go gaga. It sounds so great to me; M-I-L-A-N.
Lhasa, the peak of the world. Would feel like I am standing over the world and the creation flourishes right underneath me. Two friends who I think completely understands me? Kheta. Has been friends since high school days and was together in every little mischievous and boring thing we did. 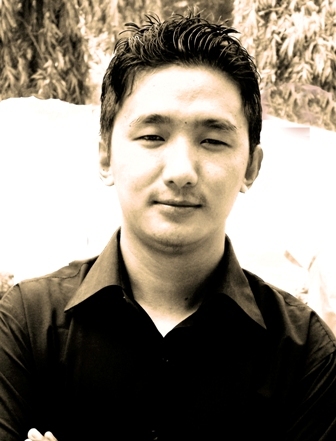 Nima Dorji. Whenever I am sad, or even excited about anything, Nima is there to share it. Has been advisor, mentor and the philosopher in my life. I am what I am able to. That I landed up in the accident and almost lost my life. It haunts me sometimes. Gets afraid when I think of the fear I caused in my parents that time. Makes me guilty of the person who owns that vehicle. Birth of my little sister. She is the cream of the family. Well, on personnel level, the best thing that happened in life could be Architecture. I joined without knowing much about it and now I am here doing it. Made me realise so much of what I could do in life.